Greasy spoon cafe on Bermondsey Street in Bermondsey. It can seat 42 people in fixed seating. 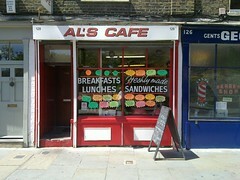 Note: According to a May 2015 comment on the LondonSE1 forum, Al's Cafe will be closing down. We haven't yet confirmed this. bob visited on a Saturday morning in July 2010. There were a couple of other customers in when I arrived around 11:30am, and a few more turned up while I was there. I had the special breakfast (£5.50) photo, which normally comes with egg, bacon, sausage, black pudding, mushrooms, onion rings, hash browns, beans, tea, and optional toast — I swapped the beans for some tomatoes. The egg was well cooked and still had a runny yolk, the bacon was slightly crispy (in a good way). and the black pudding was cooked just about right. The tomatoes were very tasty tinned ones. The onion rings were slightly disappointing, since they were the mashed onion type. The hash browns were fine, and the mushrooms were okay. The sausage was a bog standard greasy spoon deep fried one, so nothing special. The toast (not mentioned on the menu, but included free) was made from a decent enough bloomer. bob visited again in December 2010 and had an egg and bacon roll (£1.90). Accessibility info: Large step to get in and quite narrow once inside. As mentioned above, the seating is fixed in place. Last visited by bob, 22 December 2010. Last edited 2015-05-26 14:38:33 (version 6; diff). List all versions. Page last edited 2015-05-26 14:38:33 (version 6).